« Association des Plus Beaux Villages de France ». This small perched village in the Var region is a lively town for children and adults: hiking, cycling, horse riding, etc. but also concerts, exhibitions and parties. People fond of peace and quiet will love this exceptional landscape during sunny days. The historic, cultural and architectural heritage is also wonderful: Seillans is a medieval town with its castle, its church, its fountains, its paved back streets and its shaded beaches where the numerous terraces invite you to taste some typical and gastronomic meals. Art is present too. You will find a lot of artists, craftsmen and galleries. At the Waldberg house, you will discover Marx Ernst's, Dorothea Tanning's and Stan Appenzeller's collections. This whole house seems to be dedicated to the surrealist movement: lithograph, print and engraving. The Seillans village is one of the 8 perched village part of the Pays de Fayence, in the North-East of the Var region, the 7 others are: Callian, Fayence, Montauroux, Tanneron, Tourettes, Saint-Paul-en-Forêt and Mons. In this region, you will discover nature, enjoy leisure, visit heritage places and buildings, taste typical food, etc. 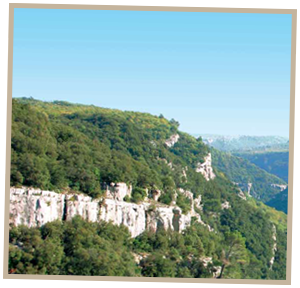 Around "la Magnanerie", you will discover amazing natural sites such as the Forêt du Défens (forest) and the Chênes centenaires (100 year-old oaks) in Callian and Montauroux, the Chênes-liège (cork oaks) in Saint-Paul-en-Forêt, the Saint-Cassien lake, the Rioutouard lake, the Gorges de la Haute-Siagne (qualified Natura 2000 site - www.natura2000.fr), the Forêt de Palayson and the Bois du Rouet. Walk along the botanic paths of Saint-Paul-en-Forêt, admire the cascades of Clar and Pare in Mons. An original way to visit the region with your family is to look for the treasure hideouts with your GPS (possible to rent one in a tourist office). Several evocative and mysterious routes are proposed: the triangle of the treasure, the rock path, under the water of the ancient lake of Meaulx, in the heart of Mimosas, etc. So many hidden treasures...to discover of course! Stride along the region on not less than 286 km of walking paths via the topo guide available in tourist offices. The guide describes the different routes, including those in Saint-Raphaël. In Seillans, you can also buy the "Lei Caminaire", a book of 100-km walks around the village. For horse riding lovers, many riding schools rent, for the day of half the day, mount and needed equipment. You can also golf at the Terre Blanche golf club (6km), in Saint Endréol (15km), in Valescure (35 km), in Taulane (35 km) or in Cannes. 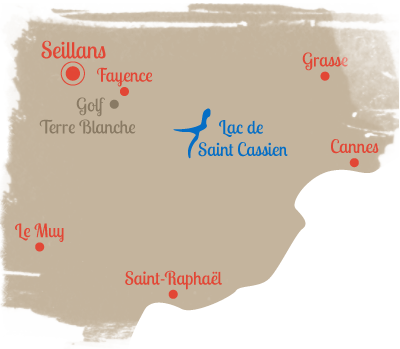 For children, play grounds are numerous in Fayence, Mons, Montauroux, Seillans and Tanneron. In Fayence (7 km), the most adventurous can also try gliding..
On Saint Cassien lake (12km), many water sport and activities are proposed: rowing, fishing, swimming, etc. 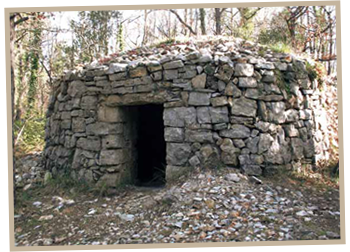 Dolmens, megalithic graves, aqueducts, shepherd's sheds, viaducts, bridges and doors, etc. These represent hundreds of years of our history, which have marked the landscape. and also the Saracen doors in Fayence et Seillans.